This year the workshop addressed a wide range of ML/ARD issues, including: flooded mine wastes; dry covers; pit lakes; dry stack tailings; collection and treatment; and prediction of drainage chemistry. The workshop consisted of 25 presentations and included issues at mine sites located in Peru, Chile and various areas of Canada and United States. 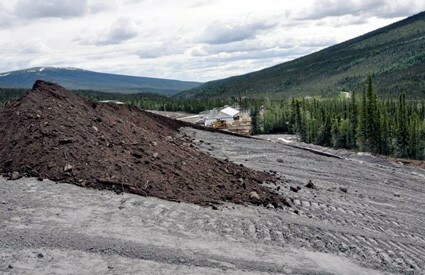 Photo: Progressive reclamation of dry stack tailings at Alexco’s Bellekeno Mine; J. Harrington, Alexco. Gibson G. Making Mine Planning Work for Communities from Feasibility Stage Through To Closure: Reflections on the Tlicho Experience in the North, NWT. 19th British Columbia MEND Metal Leaching/Acid Rock Drainage Workshop. Vancouver. 2012. Price W. and M. Aziz. The Flooded Tailings Impoundment at the Equity Silver Mine. 19th British Columbia MEND Metal Leaching/Acid Rock Drainage Workshop. Vancouver. 2012. O'Kane M. and B. Dobchuk. The AANDC Cover Systems in Cold Regions Guidance Document - Rationale for Advocating use of an FMEA for Design and Presentation of the Document's FMEA Case Studies: Part 2. 19th British Columbia MEND Metal Leaching/Acid Rock Drainage Workshop. Vancouver. 2012. O'Kane M. and B. Dobchuk. The AANDC Cover Systems in Cold Regions Guidance Document - Rationale for Advocating use of an FMEA for Design and Presentation of the Document's FMEA Case Studies: Part 1. 19th British Columbia MEND Metal Leaching/Acid Rock Drainage Workshop. Vancouver. 2012. Dukkett R., O.P. Flite and M. O'Kane. ARD Management at the Rio Tinto Ridgeway Gold Mine, South Carolina, USA. 19th British Columbia MEND Metal Leaching/Acid Rock Drainage Workshop. Vancouver. 2012. Flite O.P. and R. Duckett. Performance of the Pit Lake at Ridgeway Gold Mine, South Carolina, USA. 19th British Columbia MEND Metal Leaching/Acid Rock Drainage Workshop. Vancouver. 2012. Condon P. Dry Stack Tailings Disposal at the Greens Creek Mine, Admiralty Island, Alaska. 19th British Columbia MEND Metal Leaching/Acid Rock Drainage Workshop. Vancouver. 2012. Harrington J. Bellekeno Mine Dry Stack Tailings. 19th British Columbia MEND Metal Leaching/Acid Rock Drainage Workshop. Vancouver. 2012. Williams D., E. Villalobos, V. Cullen, J. Cassie, J. Adams and R. Tibbals. Dry Stack Tailings and Seepage Management, La Coipa Mine, Chile. 19th British Columbia MEND Metal Leaching/Acid Rock Drainage Workshop. Vancouver. 2012. Straub K. and M. Paradis. Tailings Storage Facility: Issues & Perspective of Filtered Tailings in an Arctic Environment Part 1. 19th British Columbia MEND Metal Leaching/Acid Rock Drainage Workshop. Vancouver. 2012. Straub K., J. Page, M. Paradis and D. Tremblay. Tailings Storage Facility: Issues & Perspective of Filtered Tailings in an Arctic Environment Part 2. 19th British Columbia MEND Metal Leaching/Acid Rock Drainage Workshop. Vancouver. 2012. Chatwin T. INAP and Global Alliance Update. 19th British Columbia MEND Metal Leaching/Acid Rock Drainage Workshop. Vancouver. 2012. Tremblay G. Update on MEND, including the 9th ICARD, and NOAMI. 19th British Columbia MEND Metal Leaching/Acid Rock Drainage Workshop. Vancouver. 2012. T.E. Martin. Permanent Submergence: The Long-Term Challenge and Commitment of Keeping the Genie in the Bottle. 19th British Columbia MEND Metal Leaching/Acid Rock Drainage Workshop. Vancouver. 2012. Shea J. Designing a Treatment System to Deal with the Combined Discharge from a Group of Nine Flooding Coal Mines. 19th British Columbia MEND Metal Leaching/Acid Rock Drainage Workshop. Vancouver. 2012. Martin A., J. Mackin, T. Crozier, S. Hedberg, D. Paszkowski, J. Jambor, S. Hiller and D. Gelderland. Mechanisms of Arsenic Attenuation in a Gold Mill Tailings Impoundment. 19th British Columbia MEND Metal Leaching/Acid Rock Drainage Workshop. Vancouver. 2012. Jamieson H., S.R. Walker, C. Andrade, S. Fawcett, S. DeSisto, J. Kavalench, L. Wrye, M. Bromstad, F. Opio, C. Stephen and M. Parsons. Controls on Arsenic Mobility in Mine Waste from Gold Deposits. 19th British Columbia MEND Metal Leaching/Acid Rock Drainage Workshop. Vancouver. 2012. Freed R., R. Marsland, J. Cho, I. McWilliams and S. Henderson. Investigating Loadings from Tailings and Waste Rock for Closure Planning at Nyrstar Myra Falls. 19th British Columbia MEND Metal Leaching/Acid Rock Drainage Workshop. Vancouver. 2012. Beckie R., S. Blackmore, H. Peterson, M. Javadi, M. Lorca, R. Blaskovich, L. Laurenzi, P. Urrutia, T. Hirsche, J. Dockrey, M. Conlan, D. Bay, J.C. Corazao, C. Aranda, B. Harriosn, R. Manrique, M. Lindsay, G.W. Wilson, S. Brienne, B. Klein and U. Mayer. UBC Investigation of the Mineralogical, Hydrological and Biogeochemical Controls on Drainage from Waste Rock at the Antamina Mine, Peru. 19th British Columbia MEND Metal Leaching/Acid Rock Drainage Workshop. Vancouver. 2012. Rowe R.K. Lessons Learned from Landfills about Liner Performance and Leakage. 19th British Columbia MEND Metal Leaching/Acid Rock Drainage Workshop. Vancouver. 2012. Rowe R.K. Performance and Design Features to Improve and Sustain Geomembrane Performance. 19th British Columbia MEND Metal Leaching/Acid Rock Drainage Workshop. Vancouver. 2012. Matthies R. and D. Blowes. Insights into the Fractionation of Stable Isotopes of Post-Transition Elements: Humidity Cell Study of Tailings from Kidd Creek. 19th British Columbia MEND Metal Leaching/Acid Rock Drainage Workshop. Vancouver. 2012. Amos R.T., B.L. Bailey, N. Pham, N. Fretz, S. Hannam, D. Blowes, D.C. Sego and L. Smith. Diavik Waste Rock Project: Northern Aspects and Scaling Predictions. 19th British Columbia MEND Metal Leaching/Acid Rock Drainage Workshop. Vancouver. 2012. Nicholson R., J. Stoiazzo and G. Guilleminot. Water Management at the Closed Brenda Mine Ð Reviewing a Decade of Performance. 19th British Columbia MEND Metal Leaching/Acid Rock Drainage Workshop. Vancouver. 2012. Dockery J., A. Martin and J. Stockwell. Potential Role of Nitrate in the Release and Attenuation of Selenium in Coal-Mine Environments. 19th British Columbia MEND Metal Leaching/Acid Rock Drainage Workshop. Vancouver. 2012.